So I know many of the people who do read my blog are still trying to figure out this whole makeup realm. About 6 years ago was when I OFFICIALLY wore makeup, so I know the struggles of transitioning from being a non make up wearer to a make up wearer. It’s hard man! You go into a store with so many items staring back at you & you have no idea what their functions are. 6 years ago I wish there was a list for beginners so I could have saved myself the trouble of buying things I, yet, didn’t need! So guess what y’all, I’m here to bring you THE LIST FOR BEGINNERS! & as for the Porefessionals by Benefit, I’ve always loved, I could immediately see the difference in my skin when I put it on. 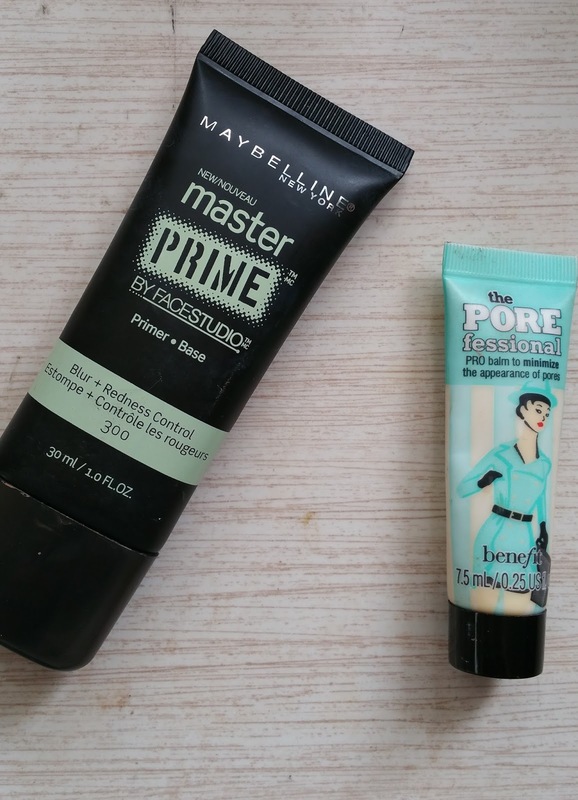 These primers are both great! 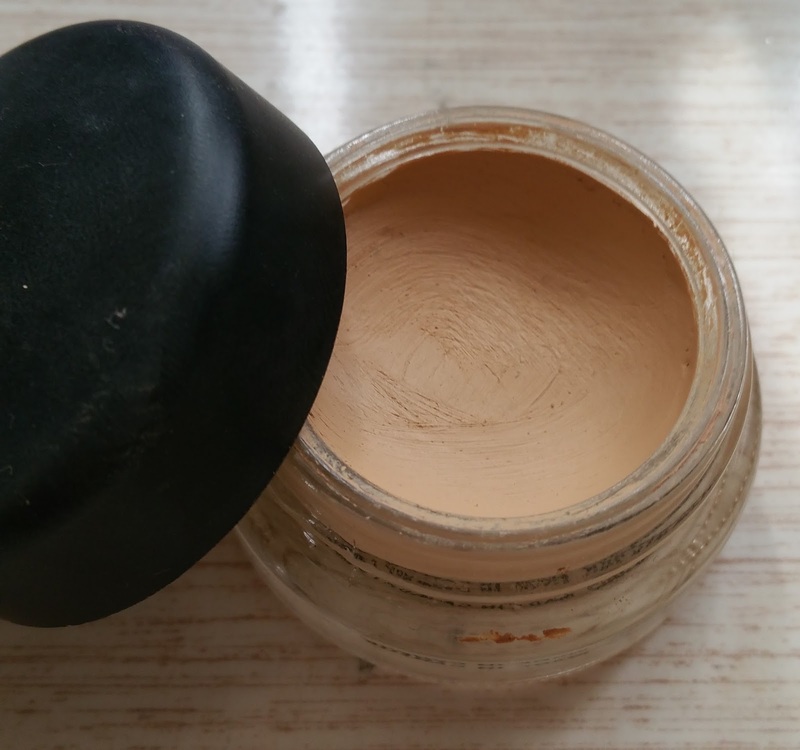 I also included MAC Paint pot for the eye primer, because just like your face, your eyes need something too! E.L.F. has a great eye primer as well! I decided to give you options incase you wanted to dive right into the higher end make up or if you wanted to dip your toes and opt out for the drugstore make up. Your choice! Foundations are an obvious must, at least a sort of foundation. 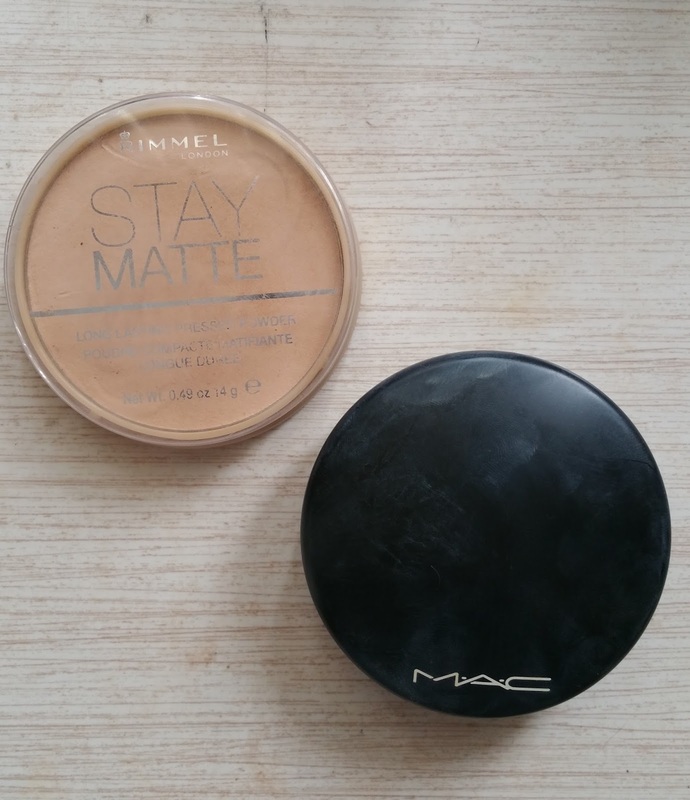 BB creams weren’t a thing when I was getting into make up so I bought heavy duty foundations from MAC Cosmetics, but since then I have found other alternatives, and just F.Y.I. MAC came up with a BB cream as well (see photo) I’ve raved about it in a previous post (check it out here) BB Creams are a God Send! They have the coverage you want without the heaviness of a foundation. Here I am showing you Garnier BB Cream! It is a good light coverage BB cream, which you can totally build up to get the right coverage. The MAC BB Cream is perfect from the first try, you can not go wrong with this! The L’Oreal INFALLIBLE is so dang perfect! There isn’t much to say other than perfection! 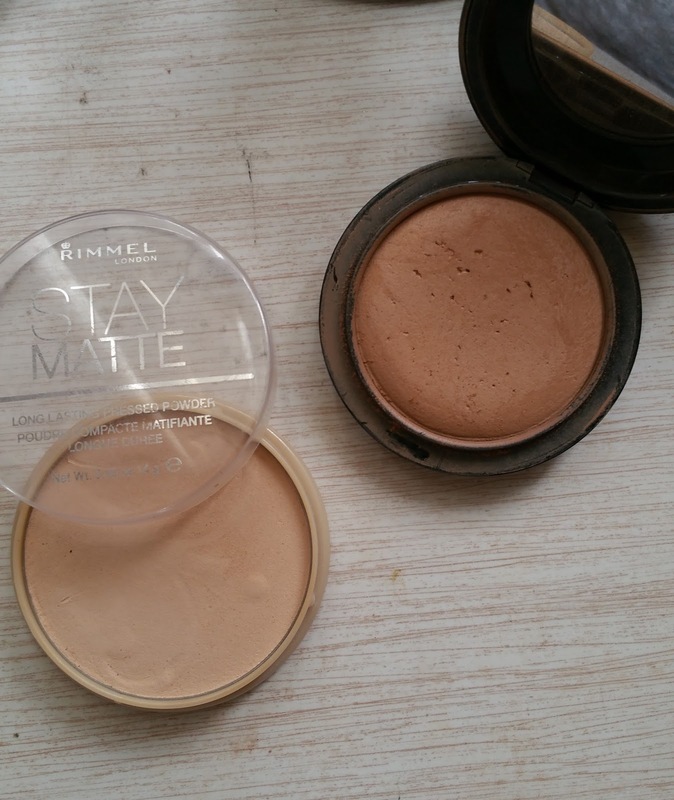 Love that it has good coverage but you can totally build up, and the best thing: It lasts all day! Concealers hide all the flaws that your foundation couldn’t do quite well! You can always use this with or without foundation. 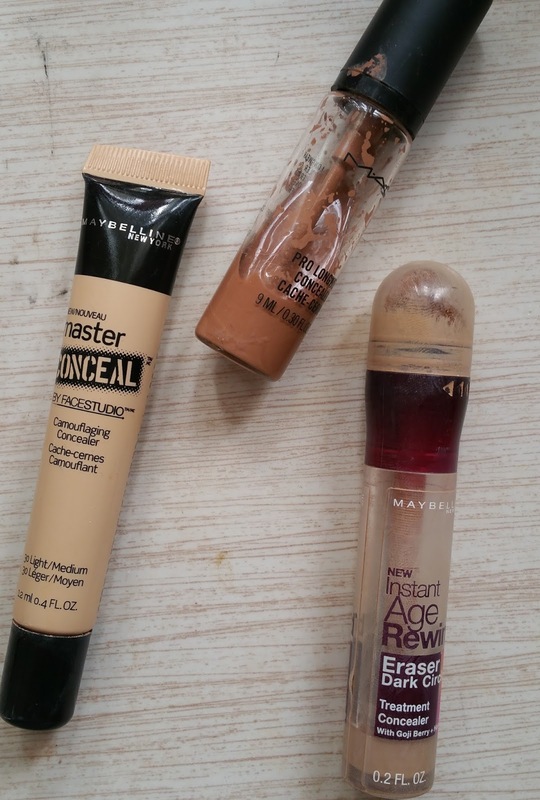 Here I have Maybelline’s Master Conceal which has a lot of coverage, Instant Age Rewind also by Maybelline, this is my every day concealer, and then there is MAC’s Pro Long Wear Concealer (Which is obviously too dark for me now) These are all great concealers, not one is better than the other to be honest, so if you are building your makeup bag around this choose the one that suits you the best. I do not have a Beauty Blender, I use a Makeup Bullet . I honestly think this is better than a beauty blender, but which ever you choose, a make up sponge is the way to go rather than brushes. A makeup sponge will guarantee full blendage (I’m sure that is not a word, but you get it) without keeping the product. You can use this for literally everything. 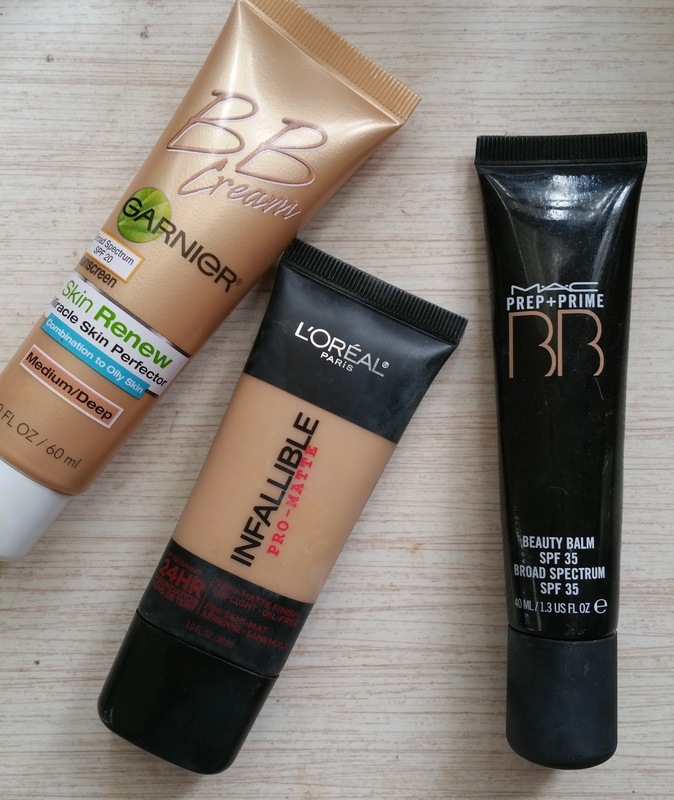 Foundation, BB Cream, Concealer, and even powder! It gives you an air brush finish, and you definitely won’t be worrying about brush strokes appearing on your face! This is number 6 but it can easily jump to number one, depending on your day! Mascara is always a must! It just makes your face look more alive and to think it just darkens your eyelashes! Here I have 2 drugstore and 1 high end. 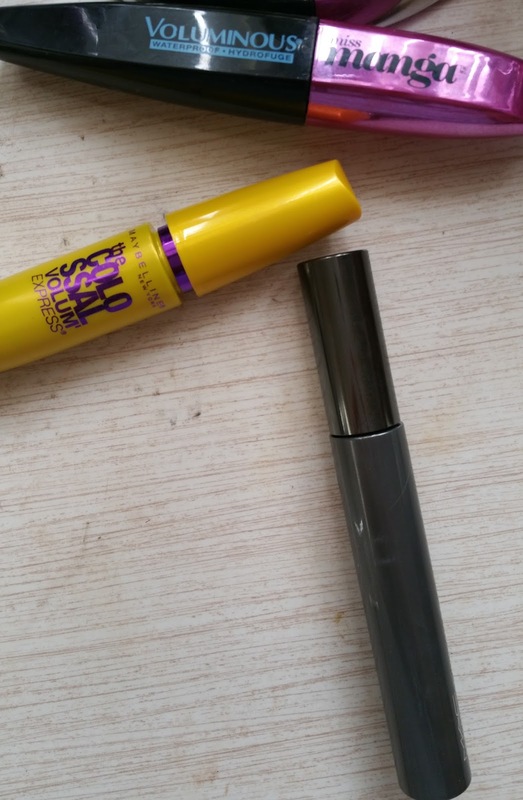 The L’Oreal Miss Manga is awesome, I don’t usually like voluminous mascaras, I like the ones that legnthen but Miss Manga has my heart (even though it is a biiiish to get off) Next is my new favorite, which is Maybelline Colossal! Let me tell you I took way too long to get on this bandwagon and I regret not joining sooner, but this baby is up there with the best of the bests! My last and my main babe is MAC’ Opulash, ever since I started trying out my own make up, this Opulash mascara has always been by my side. This is probably the most consistent thing in my life haha! If you don’t wanna do a full face, mascara saves lives! This is everything, moisturize them during the day, in the morning, at night, before you go on a date. Do it all the time!! C’mon people my favorite lip moisturizer is like 99 cents! So it’s not an investment. 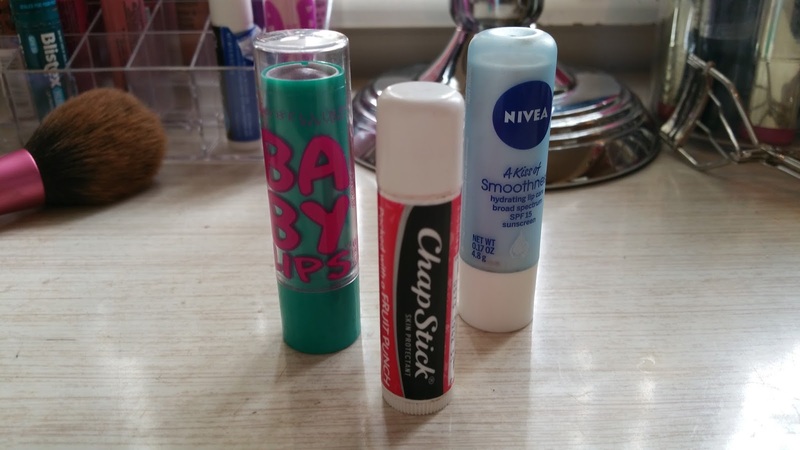 I love me some Chap Stick, I love the different scents and how inexpensive it is. The next two are at a tie. Nivea is a great company, especially for lip moistuirzers but Baby Lips by Maybelline has so many scent options and pretty colors. Which ever you like, is better than not hydrating and protecting your lips! Why is blush the very last thing on my list? 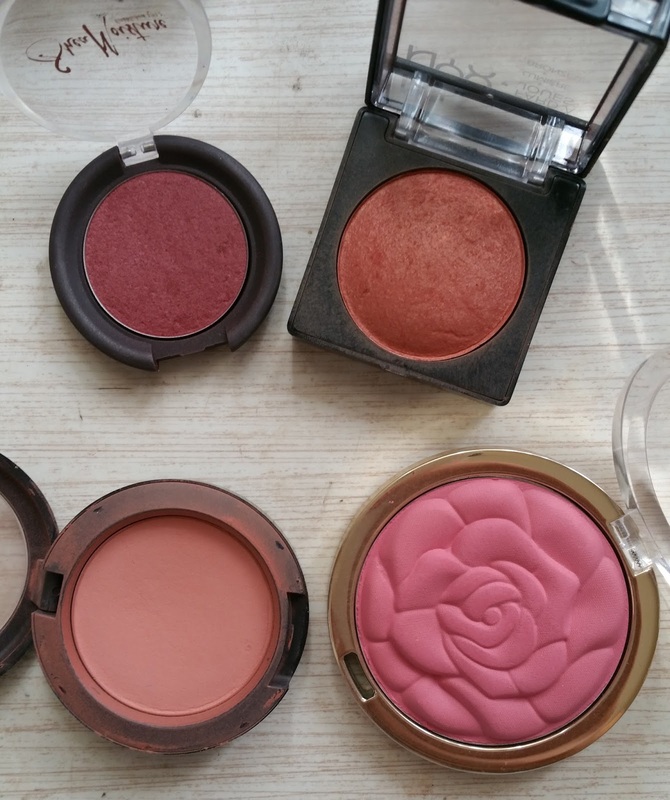 I am not the biggest blush fan, don’t get me wrong I own quite a few, but there are plenty of times I don’t grab blush, yet I go for a bronzer. The reason for this is because the bronzers I go for have a little sheen or sparkle in them which help me glow with adding color in my life. Blush is still a must, it adds life when you have those lazy days where all you can manage on is a little concealer and mascara. These 4 are some of my favorites. Shea Moisture (upper left) , which I found at target has great pigmentation. NYX Cosmetics (upper right) is a great brand and has great quality products, and their blushes are no exception. I always search for highlight effect in their blushes, because they make some beautiful ones. MAC Cosmetics (bottom left) always has great blushes for any skin tone and any season and their products are of great quality. Last but not least MILANI (bottom right) They have some good products with affordable prices, and these blushes are right n that alley! There you go babes! What you should be searching for at the store when you are just beginning or you are just a little lost on what else you might need. Don’t forget to subscribe by email or joining by Google!